Brand new and wonderful four track EP from Manchester's finest live band and no doubt highlight of the whole Ninja fam. First up two glorious re-recordings of 'Flying Wonders' and 'Fruit Machine' from one of the album highlights of 2002. 'Flying Wonders' (yum-yum) add's new percussive fills and a latino rhythm kick under irresistable guitar licks - too much and then theres Seeming To and Tony Burnside's vocals and those lush strings... yagga yagga yagga. 'Fruit Machine' moves from digital blip Hawaii to West Africa via Blackpool promenade, killer tune retwist. Of the new tracks, 'Wobbly Jack' has Graham Massey blowing seriously righteous lines from his bass clarinet while the rest of the group lay down a killer indian vs afrobeat rhythm then 'Eleven Till Seven' is outergalactic nu jazz, like Sun Ra jamming with Jazzanova behind a Bollywood string ensemble only much better - outstanding music. 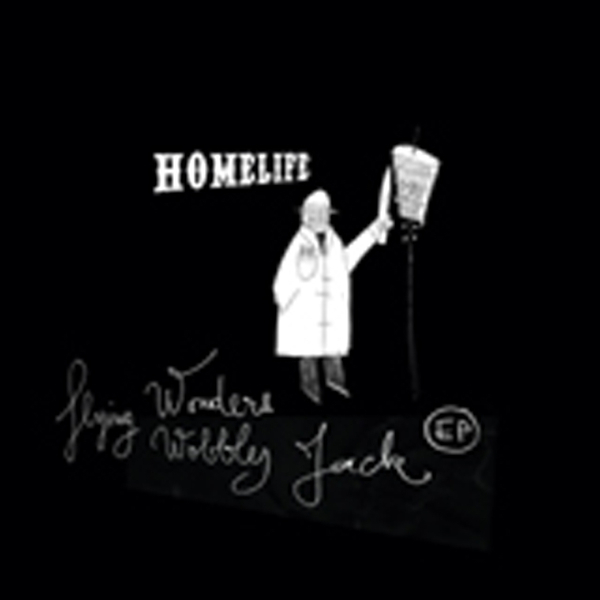 Killer EP, simply put, not many bands on the planet today are making music as unique, addictive and essential as Homelife. Buy this and find out for yourself.